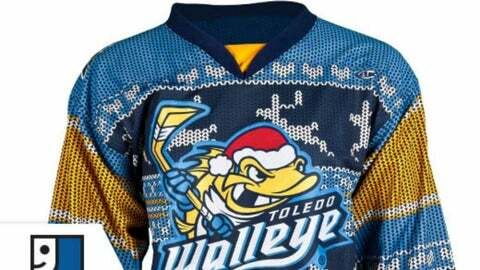 The Toledo Walleye have unleashed their ugly sweater jerseys on the social media world. For a minor league hockey team, holding an obscure promotional night is intended to bring publicity — good or bad, from near or far, however it comes. The Toledo Walleye, then, have scored a hat trick. The team is hosting Ugly Sweater Night on Dec. 28, and its players will be wearing some very, very ugly sweaters. The team’s press release promises that fans who attend the game in their ugly sweaters will see Walleye players "wearing the ugliest holiday-themed uniforms you’ve ever seen!" There’s something to be said for truth in advertising. The Walleye are 7-12 on the year and in fifth place in the ECHL North Division. In this case, anyway, they’re winning big.